You’ve dreamed of your dog helping around the house, but you’ve never thought he’d be capable of helping with the laundry, have you? This week’s Tickle Paw Tuesday installment features a video highlighting the work JTMService in the UK is doing to help people who require canine supportive assistance. Their “Woof to Wash” washing machine is a magical contraption! The sweet dog in this video proves that our canine pals are capable of cleaning the sheets they enjoy getting dirty! This week’s Tickle Paw Tuesday installment features a puppy parody version of “Royals” by Lorde, as performed by Lisa Schwartz (lisbug) on Youtube. If you can’t stop singing the original version of the song, you’ll have to learn the parody lyrics that highlight the new life of an adopted shelter dog. The starring pooch, Corny, is “gonna be spoiled” with her new life of chew toys, fine fleece beds, and retractable dog leashes. Should we admit that we are playing this on a loop? This week’s Tickle Paw Tuesday installment features a determined mouse who refuses to give up on that which he desires. This tiny mouse dreams big. The perseverance he displays as he attempts to return to his nest with a very large cookie or cracker is admirable. The mouse may be little, but his might is large. Remember, things may seem overwhelming and too large to handle, but if we apply ourselves and believe we can do it, we just might find that we go home the victor! Yes, sometimes we can have our cookie and eat it, too. This week’s Tickle Paw Tuesday installment features Metro Meteor, a retired race horse who is painting his way to a beautiful future, one canvas at a time. Metro is a testament to what love and a second chance can do for all of us. Metro creates art that helps fund his medical care needs, as well as find homes for retired race horses. Who knows what you might accomplish when you dare to try? What are you waiting for? This week’s installment of Tickle Paw Tuesday is a refreshing video of a young boy singing to two sweet dogs. We hope this crooner remains a kind and sensitive animal lover for life. This kid clearly understands friendship, and those are some lucky dogs! This week’s Tickle Paw Tuesday installment is a celebration of autumn, specifically, a husky dog who has a passion for playing in the leaves. My guys never experienced a massive leaf pile like the one in this video. I love the moment when the pup jumps into the back of the pile and just rests his head atop the leaves. This pup sure knows how to roll with the seasons. I don’t know about you, but that looked so fun, I’m keeping my eye out for a big pile of leaves, too! Winni enjoys the first taste of autumn sun. We hope that your weekend is filled with warmth, love, and a snuggle or two. Winni is providing you inspiration to schedule some snuggle time with someone you love. 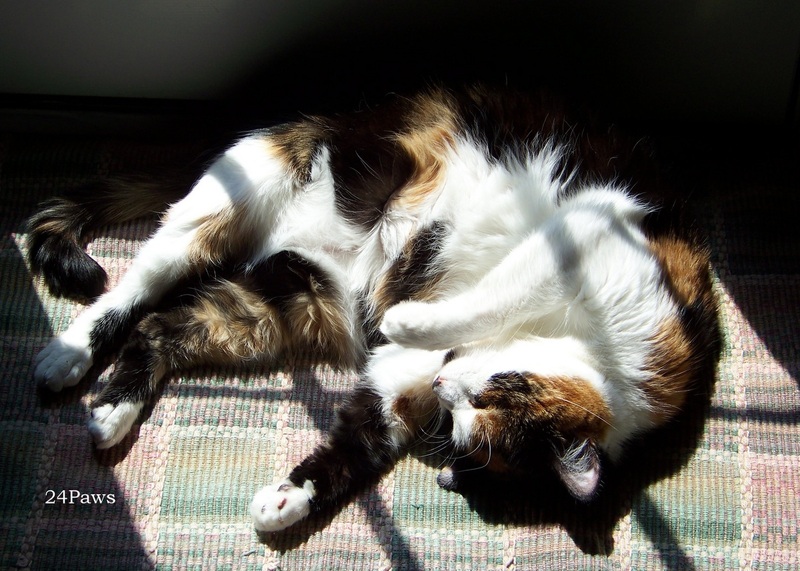 Why Do Cats Lie in the Sun?